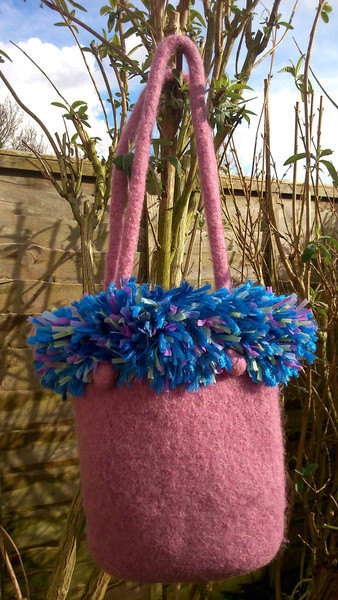 A beautiful dusky pink felted bag with a textured fiesta coloured soft trim. This design is what we call a bucket bag with a secure handle that has been actually felted into the bag. This bag is just the right size for essentials and is lovely and light to carry. The bag is 100% wool that has been hand knitted, which can take up to 4 days for big bags, and then wet felted, shaped and dried. This whole process transforms each bag from a loose knitted fabric into a dense, strong and tactile felt. All of our felted bags are 100% unique as each bag is individually handmade. The felting process makes these bags very strong and virtually impossible to stretch. All of our felted bags are easy to care for and can be brushed clean or if very dirty they can be hand washed in cool water with a small amount of detergent and then dried flat. This dusky pink bag measures 28cm at the top tapering to 22cm wide at the bottom and 29cm tall when measured flat. The handles measure 63cm in length and works as a carry bag. Got a question? Message Special Gifts Online. Items are ready to ship within 1-2 working days. All postage within the UK is £2.80, postage within the EU is £6.50 and postage to Non EU is £9.00. We understand that from time to time you may wish to return a product to us. We have created this 14 day returns policy to enable you to return products to us in appropriate circumstances.
'' A dream is a wish your heart makes When you're fast asleep,'' - Cinderella Such a lovely film and a lovely charm bracelet to match! 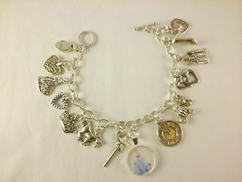 A silver plated chain charm bracelet with 14 Cinderella themed.. Flower Power! 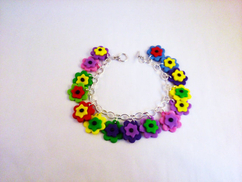 A striking, loaded flower charm bracelet with handmade fimo charms and an easy to use toggle clasp. 100% handmade this lovely fimo flower bracelet adds some glam and fun with its colourful..
A beautiful ginger tweed-effect felted bag with two discreet stripes and a toning kilt pin. Perfect as a gift, hand-felted and fabulous. 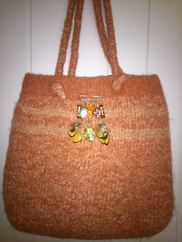 This handbag is 100% wool that has been hand knitted, which can..